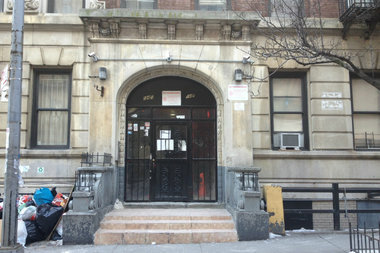 This buildling at 545 W. 146th St. is run by Nima Nabavi, who has been on the worst landlord list two years in a row. A new tool from the rental listing site Apartable lists more than 1,200 complaints and violations for the building and has Nabavi's name as one of the "registered contacts." A new website allows renters and house hunters to search data from multiple city agencies to find out whether the building they might move into has violations or other issues. The site, officially released Thursday by rental listings site Apartable, aggregates data from city agencies detailing years of complaints, violations and building permits, as well as tax histories going back to 2009, for all of New York's roughly 900,000 buildings. It combines this information with tenant reviews of buildings, landlords and management companies. "I'm just looking for ways to make the experience less painful for renters," Apartable founder Avishai Weiss said. "Landlords have all the power in New York City." While landlords often require personal information from renters about their finances, employment and past housing history, renters can have a hard time finding out much about their landlord or building, Weiss said. Landlords also often hide behind a wall of secrecy — asking tenants to make checks out to Limited Liability Companies (LLCs) that can mask who actually owns a building. The new site, however, will expose who's behind an LLC, listing owners' names under "registered contacts." It will also show what other buildings they own or operate and what kinds of violations and complaints those have. "This complete history will enable renters to pierce the veil of New York City slumlords," Weiss said, allowing them dig beyond the Public Advocate's list of "Worst 100 Landlords in New York City." "It gives you a good idea of who your future landlord will be," he added. The site uses a trove of public data from agencies including the Department of Buildings, the Department of Housing Preservation and Development and the Department of Finance. "All of the information is public, so you could theoretically get it if you wanted to, but good luck getting information from all different websites in all different formats," Weiss said. The feature includes all buildings, but Weiss believes renters will benefit most, since in the fast-paced world of New York real estate, renters often have little time to wait before signing leases. But Apartable isn't going to interpret the information. "You will have to make your own conclusion," Weiss said of a building's history, which might include violations as minor as the wrong color paint used in a hallway to a log of repeated heat and hot water complaints or rodent infestations. Apartable, which launched a bare-bones version of the tool nearly two years ago that included roughly 300,000 buildings and only included HPD violations, already has roughly 1,000 reviews, he said. One Bronx mom, for instance, posted a review of her three-unit building at 2824 Olinville Ave. that's for sale, complaining about a problem with an illegal drop ceiling. "My son has asthma and the condition of the apartment has attributed [sic] to his asthma," she wrote. Housing advocates welcomed the new resource. "Having the data all in one place is important for prospective tenants," said Katie Goldstein, executive director of Tenants & Neighbors. "Tenants should know an owner’s track records to be able to make an informed decision on the type of owner or management company where they’d like to live."